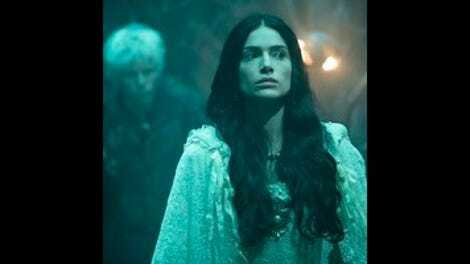 When Salem season two began, Mary Sibley was on the top of the world. She had done everything right, and even when she didn’t, she was “rewarded” with the return of her presumed dead son. She was on her way to completing the Grand Rite and solidifying herself as the Queen of the Witches. She was going to watch Salem burn, the way her heart had ages ago. She had lost the greatest love of her life (again) and her best friend and ally, but the view from the top was something that only one person could truly experience, so it was for the best. She had reached the highest high for all of her hard, nefarious work. Then Countess Marburg showed up, bathing in the blood of innocents and staking her claim as the true Queen of the Witches, and Mary finally had a formidable opponent. This was not a child like Mercy Lewis or Anne Hale, and this was not a sanctimonious Puritan like the Mathers or her husband George Sibley. This was an old witch who knew magics Mary couldn’t even dream of, and wanted to make Mary aware of that every step of the way. Still full of all the confidence in the world though, Mary barely kept up the appearance of deferring to and working with the Countess, and she tried everything she could to outsmart her. But in her underestimation of this woman, Mary found her world slowly but surely crumbling beneath her. Over the course of the 11 episodes prior to “Midnight Never Come,” Mary lost her husband (or, more honestly, her beard), a lover, her child, another friend (Isaac), her status, and her name. She lost everything that made her the baddest witch in all the land, just because she could not concede that she was not actually the baddest witch in all the land, and she found love to trump everything else. The witch war this season has promoted has not been a full-on epic battle; instead, it has been a war for power between two queens whose pawns change allegiance and choose sides depending on who the winning side is. Unfortunately for Mary, that has been the Countess this whole time. Which is what makes the fact that Anne and Tituba end up being just like everyone else in this war (besides John and Cotton, both for obvious reasons) and choose the Countess’ side in this episode all the more powerful. Even as Mary finds herself out of the pit of despair that she’s buried herself in with the past two episodes, the fact that her strength and power of persuasion is useless to two of the most moral and loyal characters (respectively) on the show is crushing. Just when Mary finds herself getting back to herself, as the strong, powerful woman and witch she’d grown to be, it doesn’t even matter. It even ends up being her downfall (again) and the thing that allows the sacrifice of John Jr. to be completed, as her bold declaration of love (and defiance of the Countess’ fake instructions) for her son ends up being the key to making it all work. Everything that Mercy Lewis has learned from Mary isn’t necessarily the wrong lesson, but at the same time, she is nowhere near the level of Mary to succeed at any of it the way she did. And for the majority of Mary’s plans, she had the benefit of Tituba or even the unknowing Isaac or Cotton to make her way through things. Mercy, however, doesn’t have the personal skills to curry such favor. Look at what happened in her relationship with Dollie, her best and only friend for a time. She can never see the forest for the trees, which becomes even more evident as she waxes romantic about how she and Sebastian are a match made in heaven. Mercy is a character who lacks awareness in a way a character as seemingly naive as Anne probably should. Of the few things the audience knows about Sebastian—outside of the fact that he’s a psychopath—the biggest trait is the fact that he is madly, obsessively in love with Mary Sibley. And based on the brief interactions that Salem has shown between him and Mercy, he absolutely hates her and her role in his family’s affairs. It would ring false for the show to have Mercy be this lovesick if not the fact that she has often been shown to miss the point, which is what leads her down these dark paths. The last thing she needs in this world is witchcraft, because she mistakes that for true power and a fix for all of the torture she has endured in her life. Here, she believes that marrying Sebastian and becoming a princess is the answer to all of her problems, which of course couldn’t be any further from the truth. Mercy’s naivete in this episode is an interesting choice, because after her “death” and disfigurement early on in the season, one would think she’d have learned something—anything at all—about who to trust or just how much to trust them. She hasn’t, and while that tracks with the character, it’s a vicious cycle. “Midnight Never Come” is an episode that tackles quite a few concepts, ones that are integral to the series as a whole. Failure and rejection. Punishment and surrender. But one of the scenes that sticks out, as it is played straight between two characters who are polar opposites—the most genuine of the show versus the most measured (at best)—is one that’s not as easy to decipher as the others. Isaac’s life since the beginning of the season has been one of failure, rejection, punishment, and surrender. He is the epitome of a character who has more than once lost everything he ever had. Last week, he finally spoke on that pain and misery and got put in the stocks for it. But here, Hathorne is the one to change of all that. It’s a scene that is clearly one designed for Hathorne’s own political gains, but at the same time, the moments when he speaks solely for Isaac’s ears and not the townspeople’s are perhaps a flash of true genuine decency from the man. Hathorne dubs Isaac “a young man with potential” and gives him the new name of “Isaac the Truth Teller” (along with clean clothing and money). To assume this is all an order from the Countess doesn’t quite check out, as she could easily dispose of Isaac if she wanted or felt the need to. It makes sense as a way to bring down the Sibley name even more, but even with that, Hathorne is truly likable for one brief moment. It’s also a scene that even more displays the hypocrisy and fakeness of Salem, as the townspeople that hated Isaac for so long are just as quick to give him food and pretend they weren’t terrible to him. One can only assume this won’t end up well for Isaac, as Hathorne has never been one to trust, and it’s actually Countess Marburg who best explains why in a separate scene. As the season comes to an end, there’s definitely a lot of plot to unpack in this episode and the season finale. As such, much of this episode feels like it’s skipping parts of the episode for time; and even the Mercy plot comes out of nowhere because of Mercy’s absence since the last time she and Sebastian shared a scene (where he had nothing but disdain for her). Salem’s biggest problem this season is that it has so much it wants to do—and mostly does get to do—that it either over stuffs an episode or it’s not able to include everything it wants. As far as series “problems” goes that’s a good one to have. In fact, there’s still so much about this very episode I want to discuss, but I will most likely save that for my review of the season finale. Either way, it makes for a compelling season, and with the finale coming next week, “Midnight Never Come” succeeds in throwing out all expectations and making the audience truly wonder what will happen. Whatever it is, it’s going to leave a mark. Sebastian: “Wanted you? No one has ever wanted you. Not your own father. Nor the Essex hive. Certainly not I. Mary Sibley is the one I desire and I shall have no other.“ As terrible as Mercy can be, even she didn’t deserve to be read for filth like that (especially by Sebastian). Sebastian also drops Mercy with the knowledge that the Countess doesn’t really see her as a daughter, as she has her own daughter… who ends up being Anne Hale. The plot thickens at Mercy’s expense. 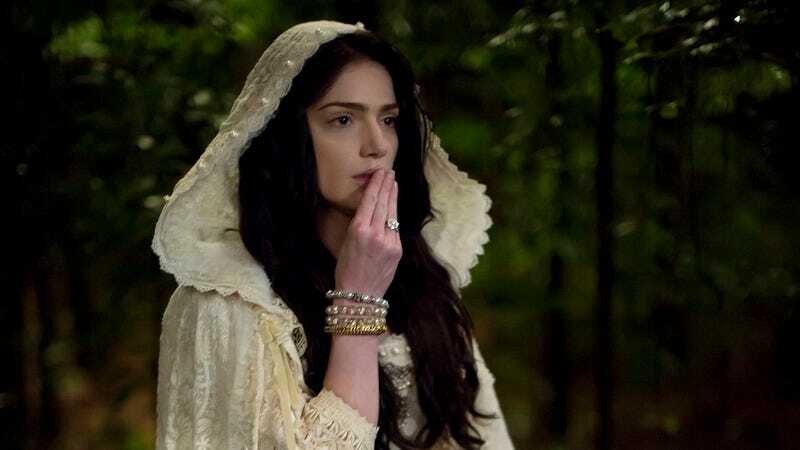 Cotton now knows Anne is a witch because of John Alden, and he sees her in the action as she heads into her secret room. Poor Cotton, but luckily he has a love spell to mess with his head. Unfortunately, he’s trapped in said secret room. Also, he and Anne are Romeo and Juliet now. Congratulations to the Elders, for being absolutely useless. However, congratulations for everyone involved in the decision to make Mary wear all white on her way to see the Elders.